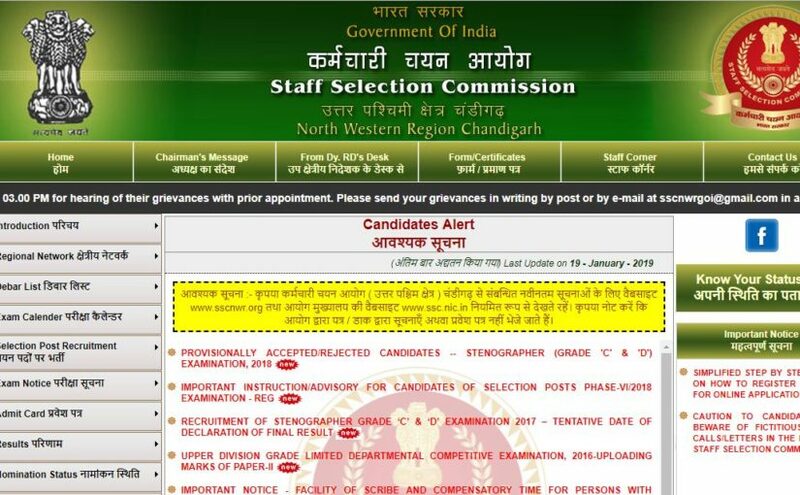 SSC Stenographer Grade C and D Provisional Result 2019: The provisional result of Stenographer Grade C and D exam 2018 has been released by Staff Selection Commission (SSC) of the North West Region (NWR) Chandigarh on the official website sscnwr.in. The candidates can check the status by logging in to the official website. SSC Stenographer Grade C and D Provisional Result 2019: The Staff Selection Commission (SSC) has released the provisional result of Stenographer Grade C and D exam 2018 on the official website sscnwr.in. The interested candidates can check the status by logging in to the North West Region (NWR) Chandigarh official website. Meanwhile, the SSC will declare the final results of Stenographer Group C, D Recruitment examinations in the month of March. According to the official notification, March 29, 2019 is the date of the declaration of the result. The result was earlier declared on November 28. Later, the candidates raise some discrepancies, then the commission decided to examine it closely. And, announce the final result on the scheduled date. Step 2: Click on ‘Provisionally accepted/rejected candidates – stenographer grade c and d exam 2018’ link, available on the homepage. Meanwhile, SSC is ready to launch SSC CHSL notification. Speaking to a leading daily, the officials from the SSC central region said that the notification for the CHSL 2019 recruitment will be declared by Friday, January 25, 2019. The interested candidates can apply through the official website.